The 2016 Upper Midwest Regional Master Gardener Conference will be taking place at the Chula Vista Resort in scenic Wisconsin Dells, September 14-17, 2016. Pollinating insects are at risk when pesticides are used carelessly. 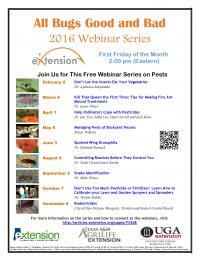 Learn practical tips to prevent pollinator deaths from Extension specialists. Learn more here. Fireant problems start with the Queen! Learn practical tips for fireant mound treatments. Join Master Gardeners from around the globe at this fantastic conference hosted by the Oregon State University Extension Master Gardener Program.